Your pet will receive the highest quality of care from our board certified veterinarian, specialized in reproduction (theriogenology), trained veterinary nurse, and possibly a veterinary student. Appointments are typically scheduled Monday through Friday between 12:30 p.m. and 3:30 p.m. Upon arriving and after checking-in at the UF Small Animal Hospital, you and your pet will be greeted by one of our client service representatives and placed in an exam room. From there our medical team will come in, take a history, and perform a physical examination on your pet, which may or may not include a veterinary student conducting the initial assessment. If a student is part of the process, they will present their findings to the veterinarian, who then conducts a final evaluation. Once the student and veterinarian have gone over all the details of your pet’s condition, they will discuss their initial assessment with you, recommend any additional diagnostics, and provide a detailed plan. We understand that your time is very valuable so we will do everything in our power to accomplish this in a timely manner. However, a reproductive workup can sometimes be time consuming, so please be prepared for an extended appointment period. Every effort is made to discuss fees prior to and during treatment. The costs associated with specialized medical care are often a concern for families. Due to the nature of some medical conditions however, it is not always possible to precisely predict the outcome or associated costs. If substantial deviation from the treatment plan is anticipated, you will be informed by our staff and a new estimate of costs will be presented to you before any new or additional measures are implemented. Fees for outpatient visits are to be paid in full at the time of service. Hospital admission, including emergencies, require a deposit of 75-100% (pending payment option) of the high end of the estimate with the remaining balance due at time of discharge. For your convenience we accept cash, checks, MasterCard, Visa, Discover, and American Express. The hospital does not offer any payment plans, however we do accept Care Credit. Care Credit offers 6 months 0% interest and extended plans with a monthly APR. Please visit CareCredit.com to see if you qualify. A referral from a family veterinarian is not required. However, we would prefer to work with your family veterinarian to provide you and your pet with the most comprehensive veterinary care. http://www.caninehealthinfo.org/breeds.html for specific breed health testing information. Will my pet be sedated? Do I need to fast him or her? Although needing sedation is uncommon, it may be necessary for certain procedures. If your pet will need to be sedated, they should not eat after midnight the night before. However, it is important to give medication, if applicable, at the normal scheduled time. Water is always okay up until the appointment. Our team will provide specific instruction the day before your appointment in case fasting is required for your pet’s visit. Why should an evaluation for breeding be conducted? Every breed of dog or cat has its own health concerns for which screening evaluation(s) should be performed. This will help to lower the risk of genetic or congenital defects for the offspring. For dogs, please visit http://www.caninehealthinfo.org/breeds.html for the required or suggested pre-breeding health testing by breed. Per hospital policy, current Brucella canis testing is required of all breeding male and female dogs. Brucella canis testing is available onsite at UF with same day results, but on occasion pets do require outside laboratory specimen testing (at additional cost) which can take about a week for results. For the female dog, ensuring that insemination is performed or mating scheduled during the most fertile period is important. During heat, timing of ovulation is done by testing for the hormone progesterone. Evaluation of vaginal cytology can also play a role in the evaluation of the cycle and for identification of infection. Initial progesterone testing is recommended during the latter part of the first week of heat. When should I contact UF for appointments? Please let us know when you expect your pet to be in heat. Occasionally, there will be times when the veterinarian is out of office and reproductive services are not available. 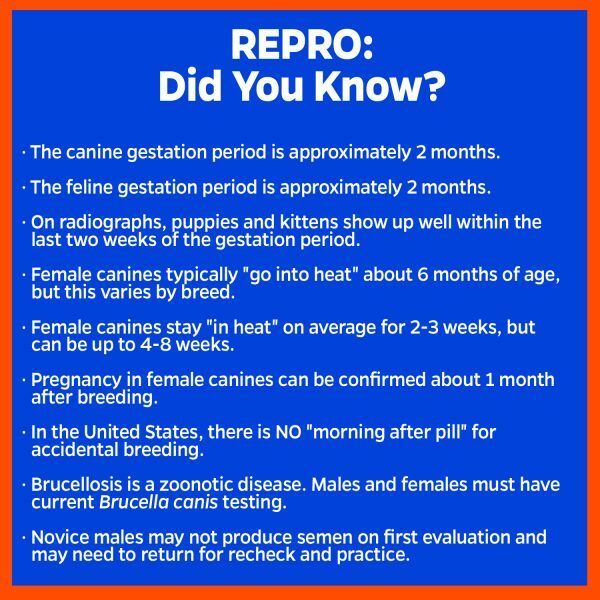 For routine breeding management and for timing of ovulation, it is recommended that your pet be initially examined during the latter part of the first week of heat. For infertility cases, please contact us for timing advice. What is involved in a pregnancy evaluation? 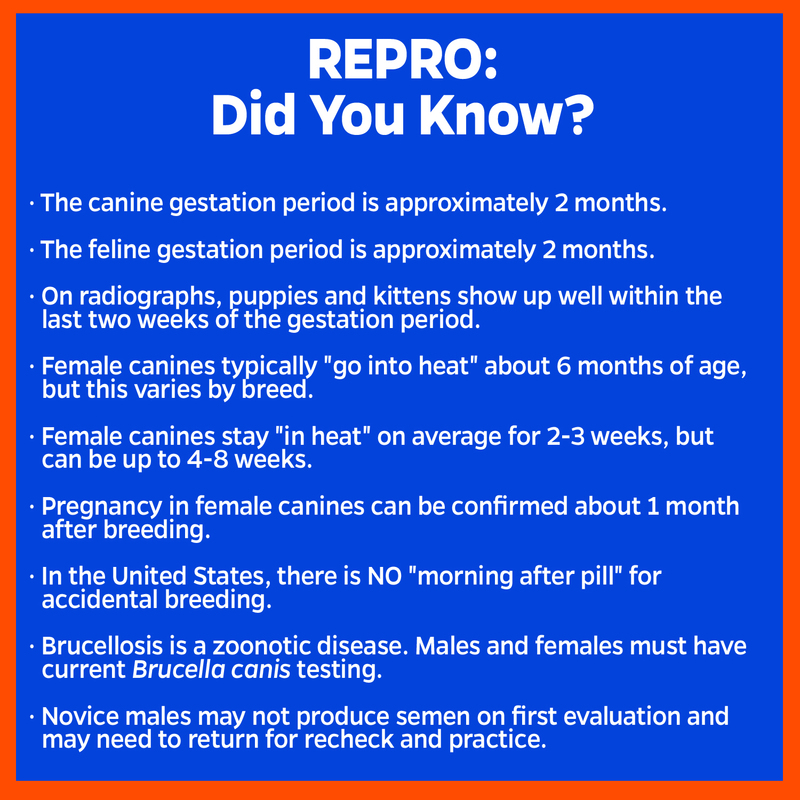 Once breeding has occurred, we recommend ultrasound testing about one month later. If pregnant, this is followed by radiographs during the last 7 to 10 days of gestation. Ultrasonography will provide determination of pregnancy status and assessment of embryonic or fetal health. Litter number and size is best determined by the late gestation radiographs. Both ultrasonography and radiology examinations are important in assessing the pregnancy and whelping plan. Do you perform any genetic or routine health testing for breeding dogs? Yes, other specialty services located at the UF Small Animal Hospital perform OFA (hips, elbows, and other) certifications, cardiac (heart) screens, BAER (hearing) testing, and CERF (eye) evaluations. We often can arrange with the other specialty services to accommodate multiple appointments during one visit.